These classics have gotten skiers to and from the slopes with impeccable style, lending credence to the idea that often times it's not about the destination. So grab a ski rack, put it on one of these classics, and enjoy the mountain journey. Nowhere in the world is the prevalence of this classic alpine vehicle and the kinship that exists amongst its owners more evident than in Chamonix. On a recent visit, our group woke up to a foot of fresh snow that covered the road and the cars parked at the end of it. Unsure if our guide was even going to make it to pick us up, our fears were eased when his Defender rumbled down the road, plowing through the mounds of snow in its way. On the ensuing drive to Argentiere, and likely necessitated by the treacherous road conditions, we passed no fewer than five other Defenders. On each passing, the both drivers gave each other a friendly wave - reminiscent of the longstanding boating tradition. The Defender was inspired by the classic American Jeep post-World War II and proved its adventure and off-road chops immediately when a British explorer drove it from England to Africa. Land Rover eventually rolled out models based on wheelbase (90, 110 and 127) that evolved into the famous Defender. Never the most refined, but a vehicle that elicits a pure, joyful driving experience that captures the imagination of those who get behind the wheel and test its mettle in the mountains. The French manufacturer Alpine had a short but illustrious 40-year run that saw it produce some of the finest sports and racing cars of its era. Like every other car in the Alpine lineup, the A110 "Berlinette" above ran on a rear-mounted Renault engine (hence the lack of a front intake grille) and was one of the most accomplished rally cars in the 1970s. It won the inaugural World Rally Championships in 1973, winning on snow, gravel and everything between and dominating every other manufacturer it competed against. The '73 event on the snow and ice at Monte Carlo will forever live in Alpine lore, as the Berlinette swept five of the top six places. The Saab 99 Turbo was really the first successful commercially-produced turbocharged car, which could whisk skiers and their families to the mountain quickly, comfortably and reliably. It remains to this day an example of a nearly perfect combination that had Road & Track raving about how fun it was to drive, calling the price "irrelevant." The 99 was also Saab's last entry on the touring circuit and dominated the Swedish events in the snow of the Scandinavian Mountains, winning in '77 and '79. The car brought many drivers onto the Scandinavian bandwagon, setting the stage for the massively successfully 900 series. While the Saab brand has left us, the cult around their cars remains. Saab owner and driving clubs exist all over the world, regularly holding get togethers and driving tours - many opting to take routes through mountain ranges all across the globe. The Porsche that started it all. The 356 was the first production automobile from the company and immediately caught on following its 1948 introduction, thanks to its beautiful lines and nimble handling. The car was sold as both an open roadster and a hardtop coupe, and it wasn't long before the 356 hardtop found itself in the mountains of Europe with skis strapped to its rear engine hood, like a hiker strapping skis to his pack. 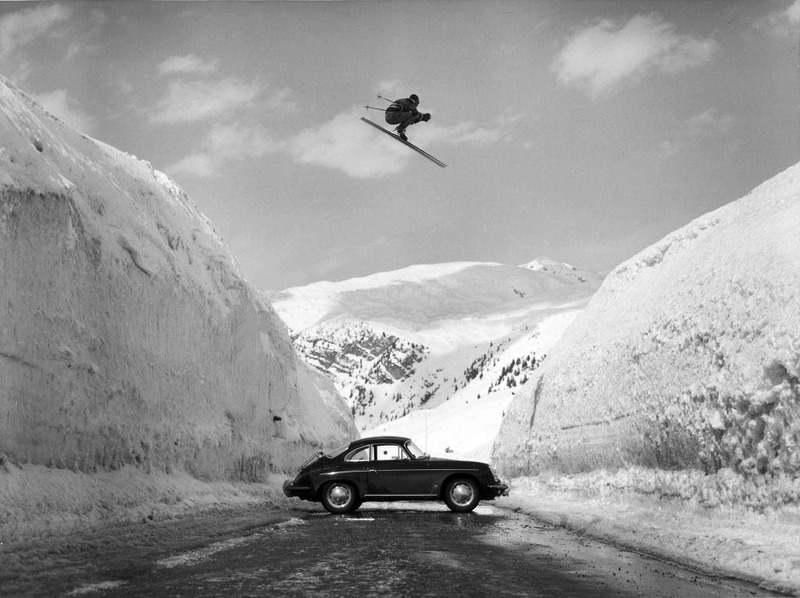 You've likely seen the iconic photo of Olympic gold medalist Egon Zimmerman of Austria jumping a road gap with a 356 parked between the snowbanks. The prevalence of this car at resorts in the 1950s can be attributed to its rear engine and rear wheel drive capabilities, which powered the car and allowed it to navigate treacherous mountain conditions despite a lack of horsepower and extremely skinny tires. There's a reason more than half of these Porsches are still around and remain a joy to drive in the snow. Consider it James Bond's preferred transportation around the slopes. This turbocharged sports car featured alongside Roger Moore in For Your Eyes Only, zooming around Cortina d'Ampezzo in style with Bond's skis mounted on the back. The car was actually in pre-production at the time, and was the first Turbo Esprit ever made before hitting the market in 1980. The Esprit went through redesigns in 1987 and 1993 then was outfitted with a V8 in 1996. Production continued until 2004, and a concept car at the 2010 Paris Auto Show ultimately wasn't produced. In 1962, BMW developed its "Neue Klasse" line of compact sedans that were designed to be both comfortable and sporty. While a few other models preceded it, the iconic 2002 hit the market in 1968 and quickly became the car that personified "the ultimate driving machine". Ahead of nearly every other car in its class at the time, the model evolved from the original 100hp model in 1968 to 130hp in the fuel-injected 2002tii to the turbocharged 2002 Turbo in 1973 that had 170hp - a staggering number for a car of its kind at the time. The 2002 set a high standard for BMW. It managed to be faster, better handling and more fuel efficient than its competitors - and was a joy to drive. The beautifully finished interior would shuttle the five skiers to the mountain in style, and it looks pretty darn good with a ski rack on top too. Perhaps no car in history has exuded as much luxury as the Phantom, which has shuttled royalty and celebrities all over the world since the first version rolled off the assembly line in 1925. It's no surprise, then, that the Phantom appears prominently in some of the most luxurious ski towns across the globe - including St. Moritz Switzerland. The Phantom has been up and down the St. Moritz streets all throughout its history, and modern guests in the resort city can experience the same feeling to this day. The iconic Bradrutt's Palace Hotel in St. Moritz picks its guests up (usually from the private airport) in a 1968 Phantom that had previously carried the queen. St. Moritz also has a rich auto club history, and the Phantom is certainly centrally involved. The British Classic Car Meeting takes place annually in the Swiss city and, in 2008, a St. Moritz Automobile Club member bought a Phantom IV (of which there were only 18 ever produced) for $750,000. He's sworn to never part with it. Toyota's legendary off road vehicle continues to be its longest running series of vehicles. It has always garnered strong comparisons with the Defender, and rightfully so - both originated as their respective makers interpretation of the American Jeep (In Toyota's case, the Land Cruiser evolved from the original FJ), and their off-road bonafides are unquestioned. Over the years, the Land Cruiser has been made as a hard top, a station wagon, a pickup truck and even a convertable. Toyota tests the vehicles exclusively in the Australian Outback, subjecting it to not just the harsh terrain but also extremely harsh temperatures. Add in Toyota's trademark reliability, and the Land Cruiser is a vehicle that will take you to the farthest alpine environments you can dream of.